Primary liver cancer is cancer that begins in the liver. It is common for the liver to be the site of metastasis (spreading) from other cancers, such as pancreas, colon, stomach, breast, or lung cancer. However, these are not primary liver cancer. For more information about cancer that started in another part of the body and spread to the liver, please see PLWC's information for that type of cancer. This section deals only with adult primary liver cancer. A risk factor is anything that increases a person's chance of developing cancer. Some risk factors can be controlled, such as smoking, and some cannot be controlled, such as age and family history. Although risk factors can influence disease, for many risk factors it is not known whether they actually cause the disease directly. Some people with several risk factors never develop the disease, while others with no known risk factors do. However, knowing your risk factors and communicating them to your doctor can help you make more informed lifestyle and health-care choices. The following factors can raise a person's risk of developing liver cancer. The main risks in the United States are chronic liver infection with the hepatitis B or hepatitis C virus or cirrhosis of the liver. Primary liver cancer usually develops several decades after such an infection starts. Viral hepatitis. Viral hepatitis is the largest risk factor for this type of cancer. Hepatitis viruses are viruses that infect the liver. Two common types are hepatitis B and hepatitis C. People who are carriers of the hepatitis B virus face up to a 100-fold increased risk of developing adult primary liver cancer. Viral hepatitis can be transmitted through exposure to another person's blood or bodily fluids through injury, by sharing needles during drug use, or by sexual contact. In the case of hepatitis B, an unborn baby or infant can become infected from an infected mother, although this can be avoided by vaccinating the baby. If you develop acute hepatitis B or C and then "clear the virus," you have no increased risk of liver cancer. Only people who don't clear the virus (those who become "carriers") are at an increased risk. Your doctor will be able to perform blood tests that tell if you have cleared the virus. Cirrhosis. Cirrhosis develops when liver cells are damaged and are replaced by scar tissue. Most cirrhosis in the United States is caused by alcohol abuse. Other causes are viral hepatitis (types B and C, as mentioned above), too much iron in the liver from a disease called hemochromatosis, and some other rare types of chronic liver disease. Age. In the United States, adult primary liver cancer occurs most often in people over age 60. Gender. Men are more likely than women to develop this cancer. Environmental factors. Some environmental factors may increase the risk of liver cancer, such as exposure to certain chemicals or eating foods contaminated with the mold aflatoxin. Risk factors are cumulative, meaning that having more than one risk factor increases the risk even more. For instance, a person who carries both hepatitis B and C has a higher risk than a person carrying one type of the virus. Most cases of adult primary liver cancer in the United States can be avoided by preventing viral hepatitis and cirrhosis. A vaccine can protect healthy people from contracting hepatitis B. In fact, the U.S. Centers for Disease Control and Prevention recommends that all children should have this vaccination. There is no vaccine against hepatitis C, which is most often associated with present or previous intravenous (IV) drug abuse. Blood banks in the United States check donated blood to make certain that blood infected with hepatitis viruses is not used. Cirrhosis can be avoided by not abusing alcohol and preventing viral hepatitis. Most industrialized countries have regulations to protect people from cancer-causing chemicals; in the United States, such regulations have virtually eliminated these chemicals as a cause of adult primary liver cancer. There is increasing evidence that certain medications can control chronic hepatitis B or C infection, and thereby reduce the inflammation they cause in the liver. This may reduce the risk of cancer development, particularly if the medications are taken before cirrhosis develops. It is recommended that information about such treatment come from a hepatologist, a doctor who specializes in diseases of the liver. If you know you have cirrhosis or other risk factors, it is important to discuss with your doctor whether you should be regularly screened for liver cancer Early detection, before any symptoms have developed, may increase the likelihood of successful treatment. Hepatologists are the doctors with the most experience in screening for primary liver cancer. You will also see the term "surveillance" used to explain this, but, in effect, this means the same as screening. 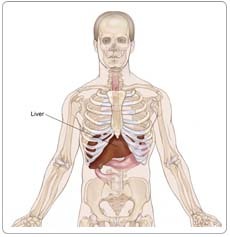 People with adult primary liver cancer may experience the following symptoms. Sometimes, people with adult primary liver cancer do not show any of these symptoms. Or, these symptoms may be caused by a medical condition that is not cancer. Symptoms of adult primary liver cancer often do not appear in the early stages of the disease. If you are concerned about a symptom on this list, please talk with your doctor. Increasingly, liver cancer is being detected before any symptoms develop by screening people who are at high risk for developing liver cancer, such as those who have cirrhosis, or those who are carriers of the hepatitis B or C virus. Physical examination. If a person has symptoms of liver cancer, the doctor will feel the abdomen to check the liver, spleen, and other nearby organs for lumps, swelling, or other changes. The doctor will also look for an abnormal buildup of fluid in the abdomen and for signs of jaundice (yellowing of the skin and whites of the eyes). Blood tests. At the same time as the physical examination, the doctor will most likely do a blood test to look for a substance called alpha-fetoprotein (AFP). In the United States, AFP is found in the blood of about 50% to 70% of people who have adult primary liver cancer. The doctor will also test for the presence of hepatitis B or C. Other blood tests can show how well the liver is working. Ultrasound. An ultrasound uses sound waves to create a picture of the internal organs. The sound waves bounce off the liver, other organs, and tumors. Each creates a different appearance on a computer monitor. Computed tomography (CT or CAT) scan. A CT scan creates a three-dimensional picture of the inside of the body with an x-ray machine. A computer then combines these images into a detailed, cross-sectional view that shows any abnormalities or tumors. Usually a special dye is injected into the patient's vein before the CT scan is done. The dye helps the liver and tumors show up more clearly. Magnetic resonance imaging (MRI). An MRI uses magnetic fields, not x-rays, to produce detailed images of the body. Sometimes an MRI can distinguish a benign (noncancerous) tumor from a malignant (cancerous) one. Angiogram. An angiogram is an x-ray picture of the blood vessels. This test may be done in a hospital, and the person may be given a general anesthetic. A dye is injected into the bloodstream, so the blood vessels of the liver show up on an x-ray. Laparoscopy. A laparoscopy uses a thin, lighted tube to look at the liver and other internal organs. The tube is inserted through a small incision in the abdomen. The procedure is usually done under sedation and local anesthetic; it doesn't usually require a general anesthetic. Biopsy. A biopsy is the removal of a small amount of tissue for examination under a microscope. Other tests can suggest that cancer is present, but only a biopsy can make a definite diagnosis. The sample removed is analyzed by a pathologist (a doctor who specializes in interpreting laboratory tests and evaluates cells, tissues, and organs to diagnose disease). The type of biopsy performed will depend on the location of the cancer. The biopsy can be taken during a laparoscopy, by fine needle aspiration (cells are removed using a thin needle inserted into the tumor), or by using a thick needle (a core biopsy). Most often it is done by a radiologist who follows the track of the needle using ultrasound to direct him or her to the particular part of the liver he or she wants to obtain the tissue from. The actual biopsy procedure usually lasts for less than one minute. It is typically not painful, and complications only arise in a very small number of cases. Your doctor will test your blood for its ability to clot before this procedure to decrease risk of bleeding after the procedure. When the AFP test is strongly positive, and the imaging and the clinical picture are typical of primary liver cancer, an increasing number of doctors are deciding that a biopsy may not be necessary. Also, if surgical removal of the tumor is being considered, most surgeons will recommend that a biopsy is done as part of the operation. It is also important to note that, with newer imaging technology, very small masses are increasingly being found. However, it is not always possible to identify what these tumors are and determine if they represent a risk to the patient's health. Under these circumstances, particularly when the mass is one centimeter or less in size, the doctor may recommend a "watch and wait" (active surveillance) approach, repeating the scan in three to six months. If the later scan shows that the size hasn't changed, the surveillance approach is continued. If it grows, however, the doctor will then do a biopsy. The treatment of liver cancer depends on the size and location of the tumor, whether the cancer has spread, and the patient's overall health. In many cases, a team of doctors will work with the patient to determine the best treatment plan. Two types of surgery may be used to treat adult primary liver cancer. The affected part of the liver may be removed, or a liver transplantation may be done. Surgery is likely to be the most successful treatment; it is most successful in patients with small tumors (smaller than 5 cm). If the tumor has spread outside the liver, or if the patient has other serious illnesses, surgery may not be an option. Hepatectomy. When a portion of the liver is removed, the surgery is called a hepatectomy. A hepatectomy can be done only if the cancer is limited to one part of the liver, and the liver is otherwise functioning well. The remaining section of liver takes over the functions of the entire liver and can, in some cases, regrow to its normal size within a few weeks. A hepatectomy may not be possible if the patient has an advanced stage of cirrhosis even if the tumor is small. The side effects of a hepatectomy may include pain, weakness, and fatigue (tiredness), and a temporary period of liver failure. The health-care team will watch for signs of bleeding, infection, liver failure, or other problems requiring immediate treatment. Liver transplantation. Sometimes, a liver transplantation can be done. This procedure is possible only when the cancer is confined to the liver, a suitable donor is found, and very specific criteria are fulfilled. After a transplant, the patient will be watched closely for signs that the body might be rejecting the new liver, or that the tumor has recurred. The patient must take medication to prevent the rejection, and the drugs can have side effects, such as puffiness in the face, high blood pressure, or increased body hair. Liver transplantation is a particularly effective treatment for people with small tumors, as the transplant removes both the tumor and the liver dysfunction that often accompanies primary liver cancer. However, there is only a limited number of donors, and people awaiting a liver transplant may have a long waiting period until a liver becomes available. The disease may progress during the waiting period. The transplant center will advise you as to how long the wait is likely to be, and what rules are used to prioritize people on the waiting list. Radiation therapy is the use of high-energy x-rays or other particles to kill cancer cells. External-beam radiation therapy is radiation given from a machine outside the body. This approach is seldom used for primary liver cancer. However, some centers are now using internal radiation therapy for primary liver cancer, which is radiation therapy given through an implant inserted in the body. Internal radiation therapy for primary liver cancer involves placing radioactive beads into the artery that supplies the tumor with blood in a manner similar to chemoembolization (see below). Depending on the type of radiation therapy used, your doctor will explain radiation protection issues and the side effects that may be expected. The general side effects from radiation therapy may include fatigue, mild skin reactions, upset stomach, and loose bowel movements. Most side effects go away soon after treatment is finished. For internal radiation therapy, there may be such side effects as damage to the stomach and lungs. However, these can often be avoided by special pre-treatment preventive measures. Systemic chemotherapy treatment. The drug is injected into a vein, enters the bloodstream, and travels through the whole body to kill cancer cells both inside and outside the liver. Regional chemotherapy treatment. A small pump is surgically placed in the body to deliver anticancer drugs directly to the blood vessels that feed the tumor. Common side effects include nausea and vomiting, loss of appetite, diarrhea, fatigue, low blood count, bleeding or bruising after minor cuts or injuries, numbness and tingling in the hands or feet, headaches, hair loss, and darkening of the skin and fingernails. Side effects usually go away when treatment is complete. The medications used to treat cancer are continually being evaluated. Talking with your doctor is often the best way to learn about the medications you've been prescribed, their purpose, and their potential side effects or interactions with other medications. Learn more about your prescriptions through PLWC's Drug Information Resources, which provides links to searchable drug databases. Some tumors located completely inside the liver cannot be removed by surgery or treated effectively by chemotherapy or radiation therapy. In fact, chemotherapy and external-beam radiation therapy are used less frequently now that a number of other approaches (listed below) are available to slow the growth of the cancer and extend life. All treatment is more effective when the tumor is small; many doctors will not use these treatments if the tumor is larger than 5 cm in diameter. Radiofrequency ablation (RFA) and microwave therapy both use heat to kill the cancer cells. RFA is probably the most widely used palliative treatment, which is to relieve symptoms of the cancer and related treatment. It may be applied under sedation through the skin, through laparoscopy, or during a surgical operation. Percutaneous ethanol injection uses alcohol injected directly into the liver tumor to kill it. Side effects include fever and pain following the procedure, but the procedure is generally very simple, safe, and particularly effective for tumors smaller than 3 cm in diameter. If the alcohol escapes from the liver, however, there may be a brief episode of severe pain. Cryosurgery uses extreme cold to freeze and kill cancer cells. Hepatic arterial infusion uses an anticancer drug injected into a catheter that has been placed in the major artery supplying blood to the liver. This treatment is a type of chemotherapy, but it does not have as many side effects. Chemoembolization is a procedure similar to hepatic arterial infusion. However, with this method, the flow of blood through the artery is blocked for a short time, so the anticancer drug stays in the tumor longer. The blocking of the blood supply to the tumor also kills cancer cells. Recently, two clinical trials have provided evidence that this form of treatment can prolong survival in some patients. In addition to being used for primary treatment of the liver cancer, chemoembolization may be used to slow down the progress of the tumor in people who are on the waiting list for liver transplantation. Biologic therapy (also called immunotherapy) uses the body's own immune system to fight cancer. Materials made by the body or in the laboratory enhance or restore the body's natural defenses against cancer. Side effects of biologic therapy are similar to the flu and can include fatigue, fever, chills, muscle pain, and headache. In addition to the treatment options described above, the doctor may suggest that the patient enroll in a clinical trial, which is a research study that evaluates new treatments. Advanced adult primary liver cancer is cancer that has spread throughout the liver and to other parts of the body. At this stage, the goal of treatment is typically not to cure the cancer, but to slow the progress of the disease and make the patient more comfortable. Therapy for advanced liver cancer may include chemotherapy, radiation therapy, or both. Palliative care can reduce pain, control symptoms, and make the patient's quality of life better.